The wants and needs of the American consumer are in a constant state of flux. However, over the past decade these changes have been so drastic that many industries have been forced to evolve at an accelerated pace just to keep up. The rebranded site merges the two brands. Branding abounds on the massive 1.6-acres site. The site caters to both high-end and pedestrian vehicles. During the great recession of 2008, much of the population was required to tighten their belts and alter their outlook on many “non essential” purchases including car washing. 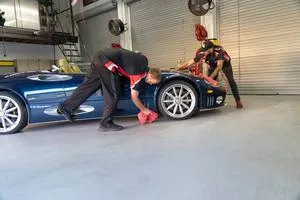 While a clean car will always be a priority for much of the motoring public, the average driver’s car care budget was slashed a decade ago, helping give rise to the low-cost express model that is so prevalent today. The economy is no longer in a state of despair, but consumers’ outlook on spending never returned to pre-recession levels. 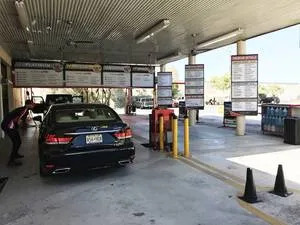 Budget conscious car wash customers have fully embraced the express exterior concept, forcing many full-serve operators to reevaluate their model and available services. In 2007, former investment banker Mike Edwards decided to make the switch from corporate finance to small-business ownership and purchased three washes in South Florida, recently rebranded Pro Car Wash. While the washes were successful and able to weather the storm of the 2008 economic disaster, Edwards decided to sell two of his three locations following the downturn. What Edwards came up with is a new ancillary business on his property that not only complements his existing wash and detailing services, but opens his business up to a new customer base. Five years ago Edwards bought the rights to a Tint World Automotive Styling Centers franchise. His car counts were shrinking as customers were flocking to low-cost express exteriors, and he knew he had to do something to secure the future financial success of his wash.
Edwards continued to search for a Tint World operator over the past few years until he meet the perfect candidate in Mark Stover. Stover has 25 years of auto detailing experience and has a vast knowledge of aftermarket automotive goods and services, making him the ideal person to run the Tint World franchise. As the name implies, Tint World specialized in automotive tint, but the business is much more than just window tinting. 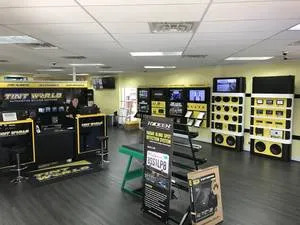 It offers alarms and remote starts, car audio and video, mobile electronics, performance upgrades, vehicle wraps, and wheels and tires. 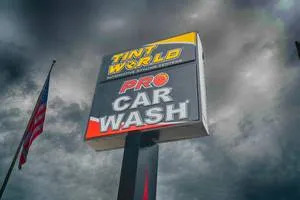 The typical Tint World franchise offers a variety of auto detailing and reconditioning services, but since Pro Car Wash had an existing full-service detailing business when Edwards bought the franchise those product offerings were eliminating from the Tint World offering. The addition of Tint World into Edwards’ services array was not a simple undertaking. He didn’t want to just tack it onto his existing business model, but rather re-imagine the entire business and breathe new life into it. Accomplishing this was a two-step process. First, the facility was renovated to accommodate the host of new services being introduced. Second, the business was rebranded to better reflect its new offerings. Tint World is split between two buildings on the massive 1.6-acre site. 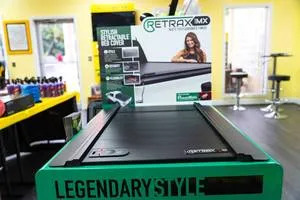 All of the tint and car wrap work is done in a dedicated two-bay building outfitted with all of the specialty equipment to print and install body wraps and tint products. 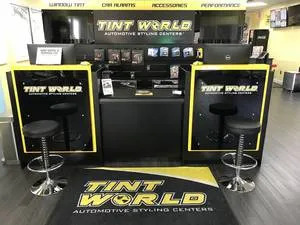 The rest of the Tint World offerings are completed in the four-bay detail center. The facility has all of the necessary equipment for the 12-volt electronics installs. In addition, the detail center was retrofitted with a full automotive lift. Prior to the unveiling of its Tint World services four months ago, Pro Car Wash was know as CarPro Auto Spa. Under the old moniker the site sported a surfing motif befitting its coastal location, complete with giant surfboards and beach-themed menu options. “When Tint World came in it was very confusing looking at all the giant surfboard signs,” Edwards says. 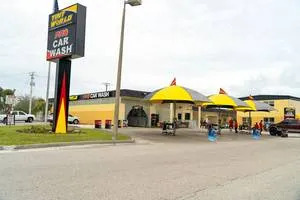 “It was the perfect time to rebrand the car wash. Now the two brands look like brother companies.” The Tint World franchise has established a fresh revenue stream for the wash and helped ensure year-round income when the Florida snowbirds fly north for the summer. But Edwards has additional changes on tap to continue to transform Pro Car Wash in the face of increasing express exterior competition. Because of the massive scale of the Pro Car Wash facility, a complete remodeling doesn’t make financial sense. But by installing pay stations at the entrance, some upgrades to the wash equipment, and a bank of free vacuums, the site will be able to provide quick, inexpensive washes. This will allow the wash to attract price- and speed-conscious consumers while continuing to cater to its traditional full-service clientele. As the marketplace continues to evolve savvy car wash owners remain fluid and are able to adjust to changing consumer demand. Mike Edwards’ market shifted, he could have placed his head in the sand and ignored the writing on the wall or he could have acted. He chose to act. By introducing a host of new services and rebranding his site, Edwards has rejuvenated Pro Car Wash and set the business up for continued success in an increasingly volatile and changing market.